Jim Kilty, owner, and operator of Green Leaf Chem-Dry grew up in the North East (Massachusetts) and joined the USAF in 1989. He retired from the United States Air Force in May of 2009 and then worked as a contractor for a number of years. He wanted to be a business owner for many years and finally was able to do that when he opened Green Leaf Chem-Dry in February 2017. Green Leaf Chem-Dry is excited to bring the most professional and effective carpet, area rug, upholstery, tile and stone cleaning service available! We look to provide our customers with the cleanest and fastest drying carpets and upholstery in the industry. When we’re invited into your home or business, we promise to expertly apply our products so as to be gentle on carpets and property and non-toxic for people and pets. Our cleaning services will be delivered by trustworthy, friendly professionals. Eventually, Robert Harris discovered the ideal cleaning formula. His unique carbonated solution delivered exceptional cleaning and was also safe and non-toxic. Harris founded Chem-Dry and soon the demand for his superior cleaning services grew exponentially. His entrepreneurial journey blossomed into a thriving success that has continued to grow since those first days in the early 70’s. 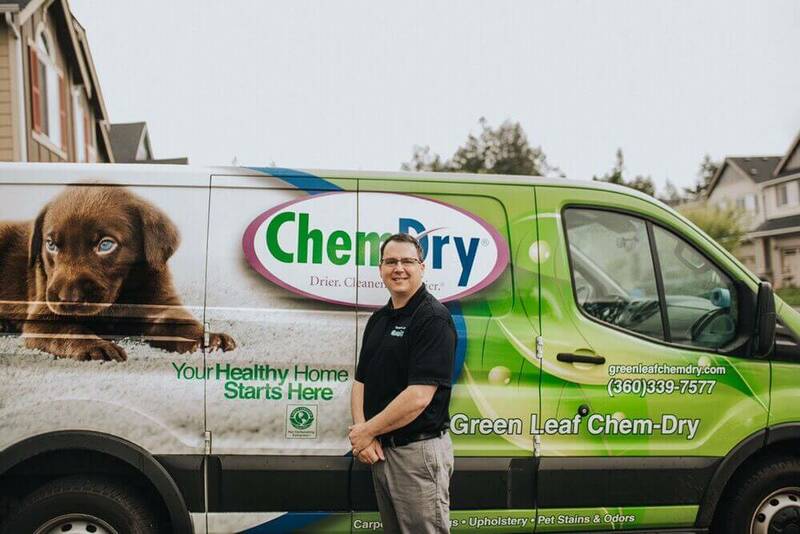 From the very first small group of franchise locations, the original Chem-Dry network has expanded over recent decades to offer thousands of successful franchises throughout the world, including Green Leaf Chem-Dry based out of Olympia, WA.